These cinnamon baked apple slices have a thick brown sugar glaze but is not too sweet, since I used tart Granny Smith apples. Ever since I was a little girl, apples and pork were flavors that I really loved. I often make homemade applesauce to go with a pork dish but for tonight’s dinner, I am using apple slices instead. What is a good substitute for applesauce as a side dish for pork? Applesauce is often used with pork as a side dish. But the texture of it is usually quite thin and many store bought applesauce brands don’t have a lot of flavor. This dish for sliced baked apples gives the flavor of applesauce but with a lovely texture that comes from baking the slices and not mashing it all up. And the flavor? TO-DIE-FOR! This side dish has the taste of my hasselback baked apples but is much easier to make, since you are flavoring just the apple slices. 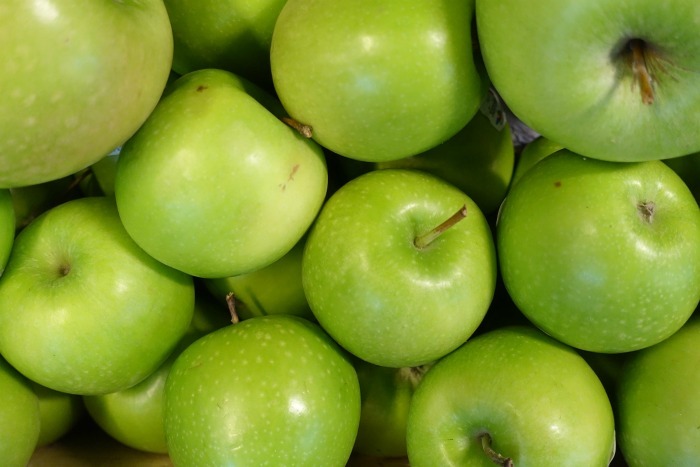 I like to make this recipe with Granny Smith apples. They hold up well in the oven and have a nice texture. You can make so many things with apples, especially when the texture is firm. If you have ever eaten just the filling of Granny’s apple pie, you will get an idea of this recipe. Thick, gooey, sweet, tart and everything that is good in the fall. The baked apple slices recipe seems sort of like an apple pie without the crust side dish, but is every bit as good as the pie itself. Apples are my favorite fall fruit. I make apple pies, caramel apples, spooky apple treats, baked apples, apple crisp, apple cake, apple cobbler and now – sliced baked apples. You name it. If the recipe is made from apples, it will find its way to my dinner table. 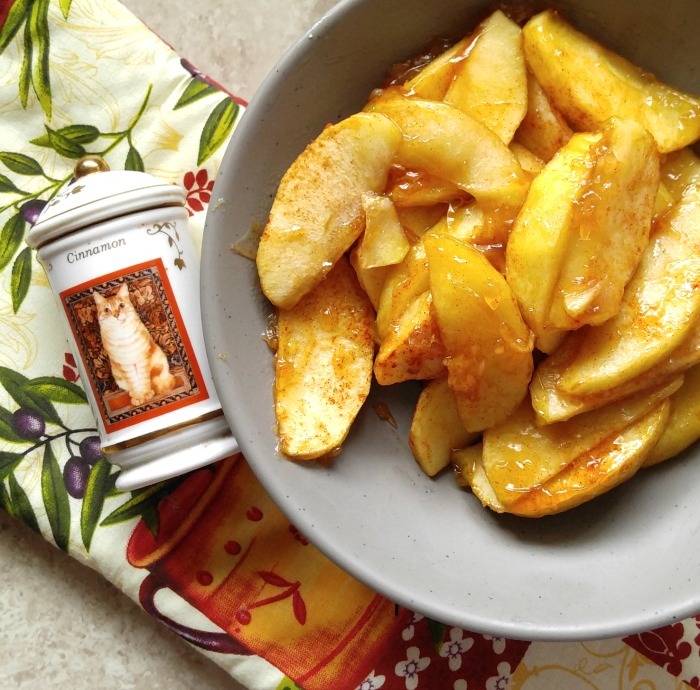 These cinnamon baked apple slices are the perfect side dish to compliment pork. 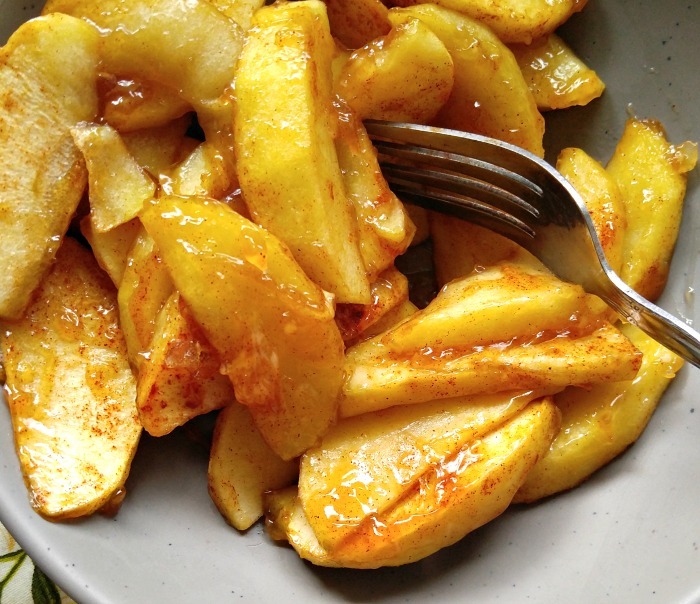 The ingredients for these easy baked apple slices are just a few. The recipe has only five ingredients and one of them is water! 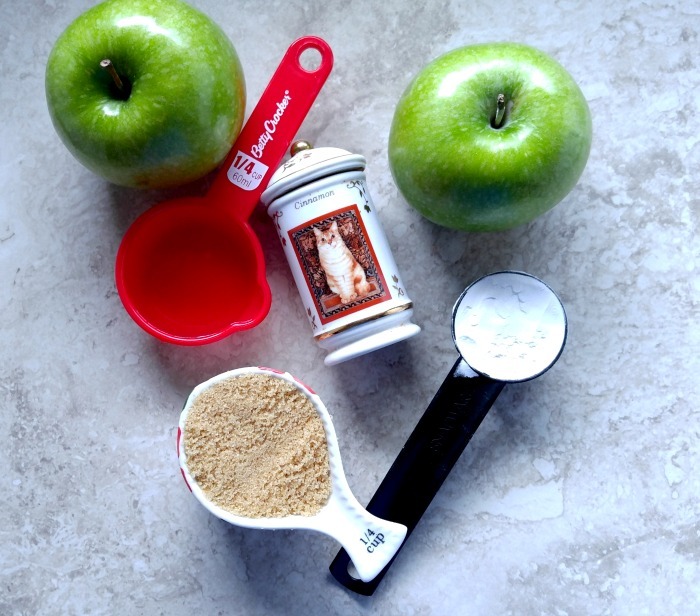 A couple of Granny Smith apples, some water, with cornstarch to thicken it, a scoop of brown sugar and a pinch of cinnamon are all that you need to complete the recipe. I love that it is easy, simple, but so, so tasty when the the baked Granny Smith apple slices are done! 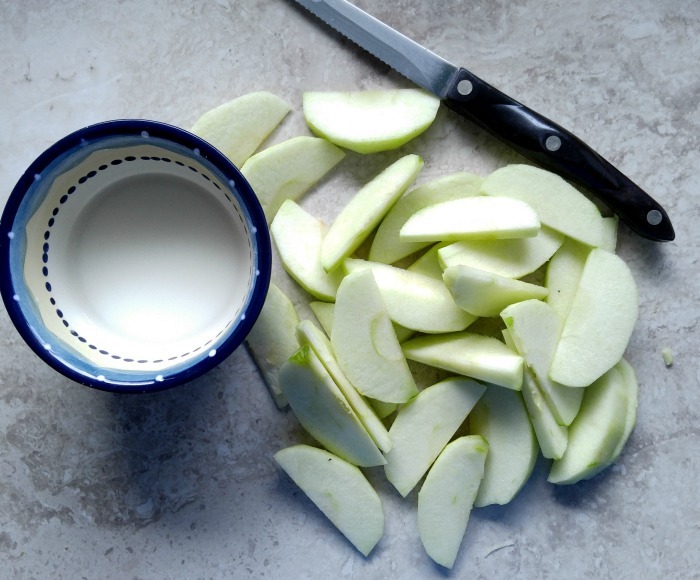 I started the recipe for baked apple slices by mixing the cornstarch and water in a small bowl. This mixture will thicken the other ingredients into an ooey-gooey texture. I also peeled my apples and sliced them fairly thickly. You don’t want them too thin or they will end up overcooked. 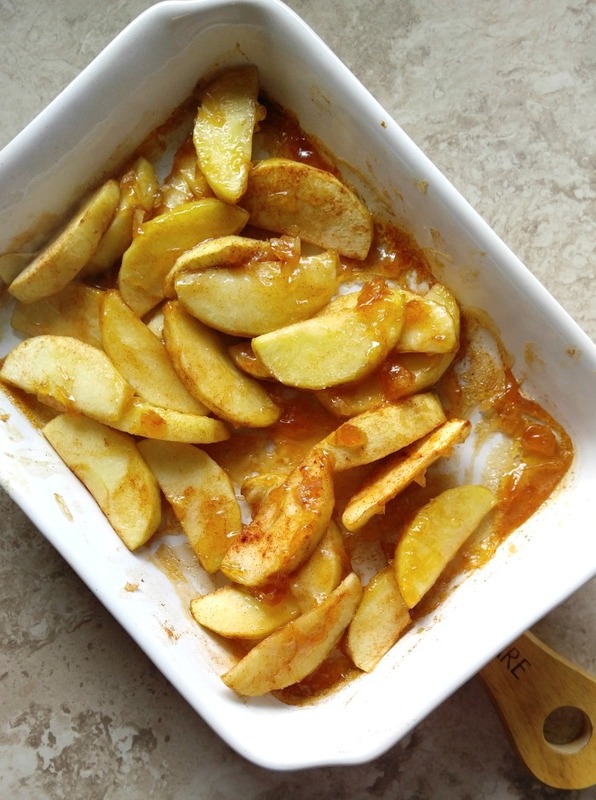 Place the sliced apples in an ovenproof baking dish and pour over the cornstarch and water mixture. You will want to coat the apples well. Pour in the brown sugar and mix the apples well with it. You will want some of the sugar to stick to each apple, since this is what the cornstarch mixture will thicken. Sprinkle the top of the ingredients with a generous pinch or two of cinnamon to give it some extra fall like taste. Into the oven they go for about 15 minutes at 350º F. Baking apple slices is that easy! Look at the gooey glaze! I can’t wait to try them! 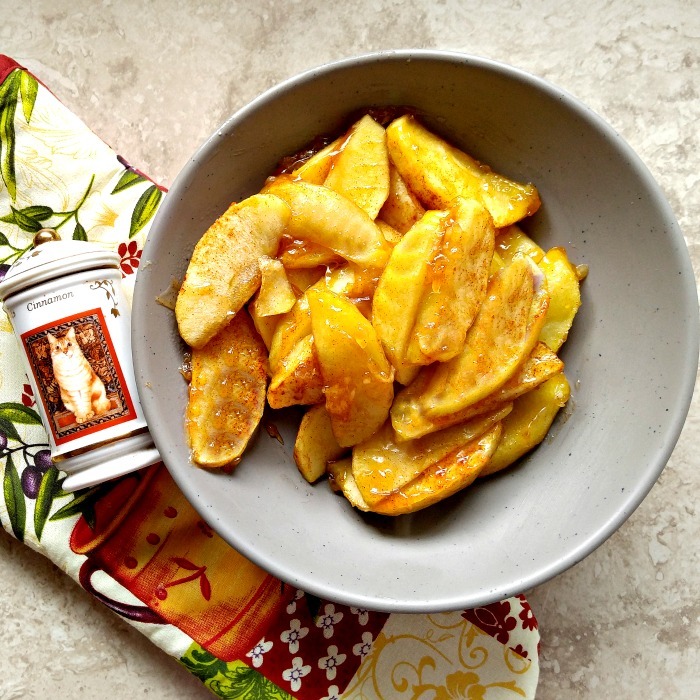 The baked apple slices with cinnamon are fork tender and sweet but the tartness of the apples keeps the sweetness in check. Cinnamon the kitty approves of the taste very much! This cute kitty is part of my spice jars called Cats of Distinction by Lenox. I was amazed, recently, to find that they are quite collectible! Serve the quick baked apple slices hot with pork chops for a comfort food dish that really screams fall. Gone are the days of boring applesauce and pork. 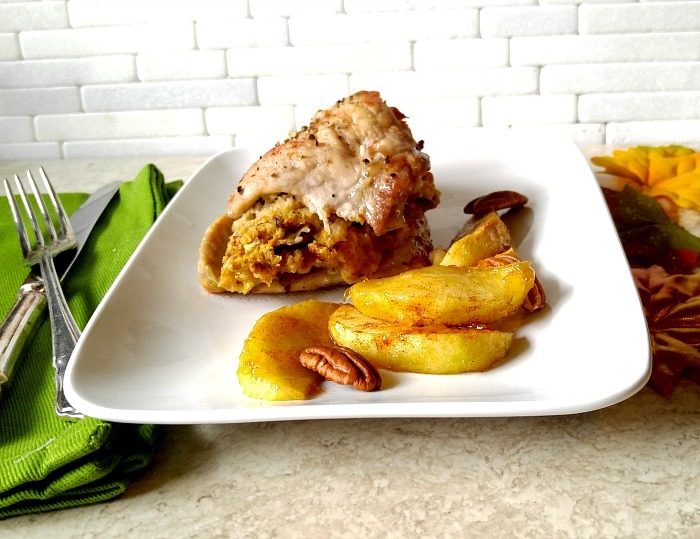 These cinnamon baked apple slices and pork and definitely my new fall combo. Perhaps they will become yours too! Lighter than an apple pie and so delicious! The yummy warm baked apple are great on their own, but extra yummy with a dollop of whip cream or some ice cream. They make a wonderful side dish, a super tasty snack and a great after work out treat. These baked apple slices have a lovely brown sugar and cinnamon glaze that could not be easier to make. They are the perfect choice when you have a hankering for the taste of apple pie, but don’t have the time to make one. And if you are trying to omit the calories of a pie crust, you can get your apple pie fix in just minutes by baking just the apple slices. The recipe is naturally gluten free and has 188 calories per serving – MUCH less than a slice of apple pie with most of the flavor! 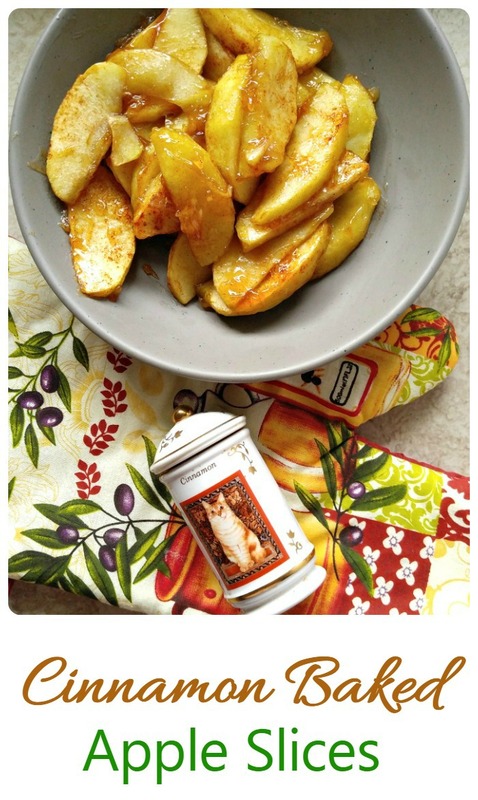 If you would like a reminder of this recipe for cinnamon baked apple slices, just pin this image to one of your Pinterest cooking boards so that you can easily find it later. I served these tonight with some apple and pecan stuffed pork chops. The combination of flavors was amazing! For more fall recipes, please visit my “It’s time for Fall” Pinterest board. 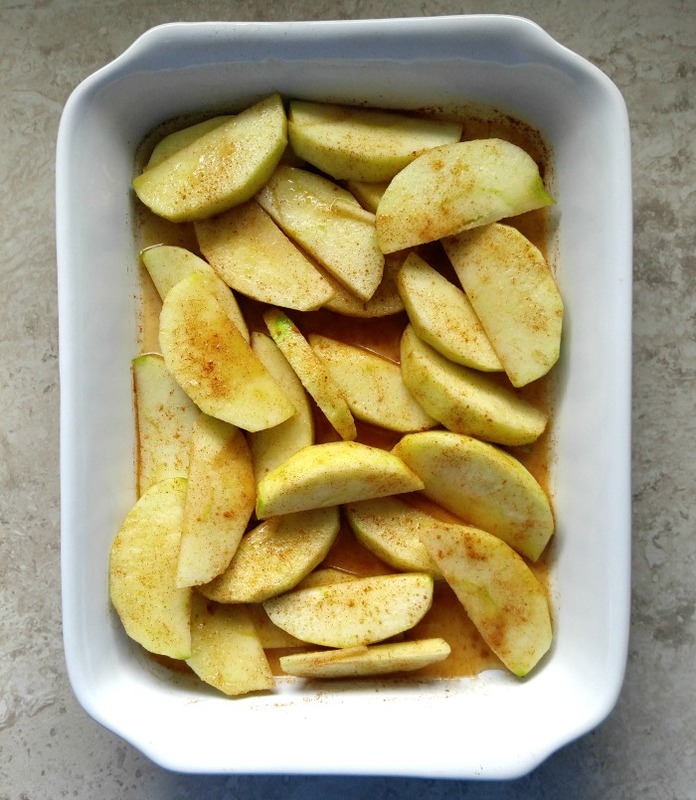 Admin note: This post for warm baked cinnamon apple slices first appeared on the blog in October of 2017. I have updated the post with some new photos, nutritional information and a video for you to enjoy. 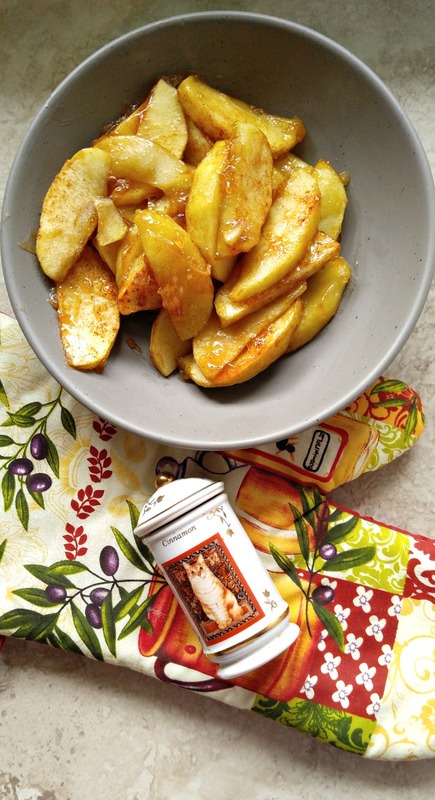 These cinnamon baked apple slices are the perfect side dish to accompany any pork recipe. I love them in the fall! Mix the water and cornstarch in a bowl until well blended. Peel and slice the apples thickly. Place them in an ovenproof baking dish. Pour over the water/cornstarch mixture and mix well. Add the brown sugar and mix so that all the apple slices are coated in it. Sprinkle with the cinnamon. Bake for 15 minutes. Serve warm.